It may seem like an unlikely pairing, the academic and author Douglas Brinkley teaming up with one of the world's biggest movie stars to edit a little-known unpublished novel by the late folk singer/songwriter Woody Guthrie titled House of Earth. But that is in fact in the works. 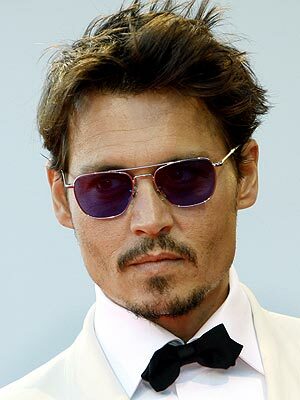 Johnny Depp is partnering with Brinkley whose writings eventually informed documentaries including Spike Lee's Hurricane Katrina work When the Levees Broke: A Requiem in Four Acts as well as the 2004 doc Going Upriver: The Long War of John Kerry. Brinkley stumbled upon the work, which Guthrie finished in 1947, while researching an article about Bob Dylan for Rolling Stone. Brinkley happened upon the manuscript and told the New York Times he did not know of its existence. He cited two biographies about the late folk singer, who would have turned 100 this coming Saturday (July 14th), but neither mention Guthrie's manuscript, which he completed in 1947. The story revolves around a West Texas couple are confronted by banks and lumber companies as they work to build adobe homes as protection against harsh weather. Brinkley and Depp wrote an essay for the New York Times Book Review about Guthrie's work, describing it as a "portrait" of life in the Dust Bowl during the Great Depression. Guthrie was born in Oklahoma and eventually traveled with migrant workers to California during during the era and was frequently linked to left-wing groups at the time. His guitar often had the slogan "This Machine Kills Fascists." Exactly how the Douglas Brinkley/Johnny Depp tie-in has been left vague, though one can't help but think there is a possible movie in the works longterm. The two have known each other since the mid '90s through Hunter S. Thompson. The two partnered in writing the liner notes on a soundtrack for Alex Gibney's recent doc Gonzo: The Life and Work of Dr. Hunter S. Thompson. Brinkley said House of Earth will be released in the Spring of 2013 by a "major New York publisher." I simply could not go away your site before suggesting that I actually loved the standard info an individual provide on your visitors? Is going to be again regularly to check up on new posts.